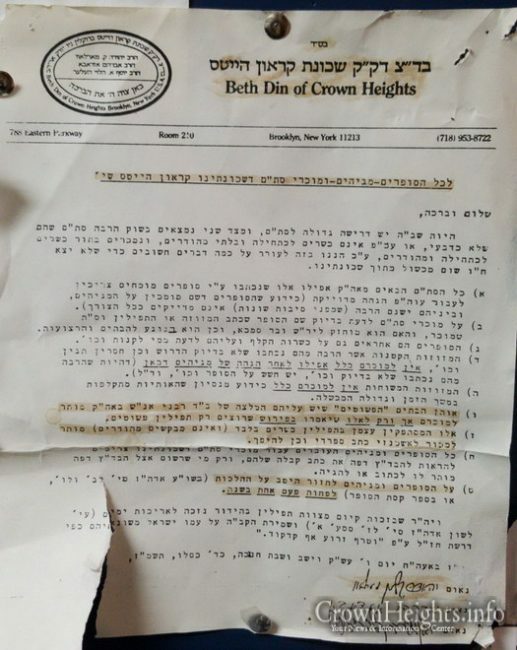 A letter published by the Beis Din of Crown Heights addressing low quality and questionable Mezuzos and Tefillin has surfaced on social media. The letter is dated Chof Daled Kislev, 5747. 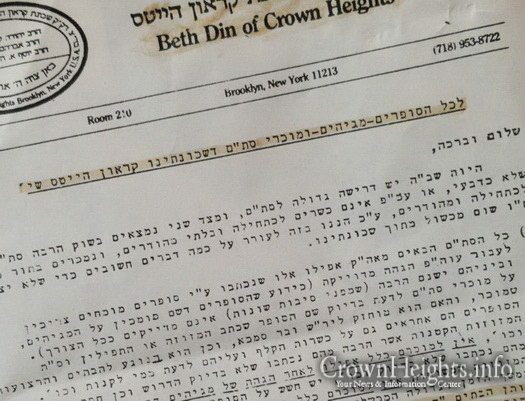 A letter signed by the Beis Din of Crown Heights has surfaced on social media that discussed low quality tefillin and mezuzos sold by Crown Heights Sofrim. 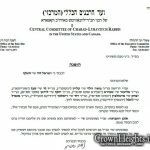 The letter is addressed to the Sofrim and sellers of STAM in Crown Heights, and sets guidelines for what may be sold in Crown Heights. These guidelines include placing responsibility of quality of the mezuzos and Tefillin on the sellers of STAM in Crown Heights. 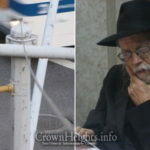 One of the guidelines required all mezuzos sold in Crown Heights to be double checked by a “Magiah” before being sold. It’s important to note that the mezuzos involved in the scandal were not of those banned by the Rabonim. You think that all these mezuzos were checked by a “magiah? Yes, they absolutely were. Once if not twice. Yeah they are checked by real sofrim and computer checked as well. There are different opinions on how a mezuzuza should be. I hear that the klaf we use according to many poskim of old we have trief klaf. The mezuzah’s are not the same but better trust those who claim they are more religious. Terrible how people don’t understand there are other opinions who would they are 100 kosher. It’s very easy to say something is treif, a sofer or someone who checks these mezuzah’s and knows the actual laws can tell when things are kosher. The newer sofrim don’t know all the laws just are told this is good and this is bad and are not taught all opinions. This includes vas leshmeros Stam who won’t follow all the same halachos. Where the rabonim state that bottom tier tefillin should not be sold unless specifically requested. It would be reasonable to say that they would said the same about Mezuzahs – so long as the mezuzahs are not being sold as “Mehudarim Kosher lechatchila”, it would seem that the Rabonim would permite it. why is wolf taking this into his hands. if he wants to do something he should have just publicized this letter from the rabbonim. And the least expensive kosher meat with GASP a shoichet, bodek, mashgiach, hechsher, salting, nikur…I AM GASPING at the costs, it is so “not practical”, so therefore what…get by without shchita and all the other expensive costs????!!!!!!!!!! What are you saying, genius? Yes, it costs to have kosher ANYTHING! Just a few weeks ago I put up a lot of mivtzoim mezuzahs for a family that is struggling financially, otherwise they would spend more. One of the family members is very unwell. How deceitful and unethical to sell these mezuzahs as Kosher. Are the sellers pleading ignorance, are they blinded by greed? Don’t say we shouldn’t buy them anyways, if the mezuzahs are on the market they have to ensure it’s a kosher product or don’t offer it. What should I say to that family? Oops, don’t the mezuzahs might be pisul or kosher bedieved, maybe with some fixing. I have a video – COMING SOON! I went with 2 witnesses to 10 eateries in Crown Heights. I ordered a leafy vegetable salad in each place. I placed each salad in a ziplock bag marked by a number reserved for each eatery and took the bags home. I invited 2 mashgichim from established kashrus organizations to inspect the salads for insects. 9 out of the 10 eateries have salad infested with at least 3 insects in them! Only ONE eatery had salad with no insects in it – Mermelstein’s! I own a cafe in Crown Heights and if you DARE put out such a video, I will sue your pants off and I will get EACH restaurant/pizza shop/bakery/sushi store to join me in a Din Torah against you. HOW DARE YOU try to take away my parnassa??? You must be related to the one eatery that has no bugs in their salad! How is it even possible that only “one” eatery has 100% no bugs on the salad? And why are you targeting Crown Heights eateries and not BP, Willie or Flatbush? You are making a chillul Hashem and chillul Lubavitch! And besides, there are different shittos about what is considered an insect! Some insects need to be with feet and large enough to see without a magnifying glass! You took the most machmir shitah on bugs just to get us all bugged out! Besides, you did not name which “kashrus organizations” were used to check for the bugs. It is known that Mishmeres Bugs find insects that no one else can find! Look, we know that you have an agenda – you just don’t like salad. You never liked salad and for years you complained about the taste of salad. Many great erlich yidden ate in my cafe and THEY ate my salad, so that PROVES that you are just making up stuff. I sell hundreds of pounds of salad a year and you only bought a small sampling of my salad – so what does your experiment prove – that ALL my salad is infested with bugs?!. Besides, the salad is sold as a side dish, it is thrown in with a main course. No one expects a meal that “comes with salad” to get a perfect salad. People know you get what you pay for. Finally, what is YOUR hetter for loshon hara, rechillus and giluy arayos/toloim? If you had a “beef” with my milchig salad (I guess bugs might be fleishig), you should come and talk to me and we can work things out! Why go public! I must end with the customary name calling: you are a Korach, an Essov, a Misnaged, an Oisvorf, and a Mossor! I will see you in court and at the Bais Din shel Matta! Take a chill pill! I think the “I have a video” was a parody / joke of the mezuza video. But if your salad is actually infested with bugs – DO SOMETHING before I make such a video myself!!! All your excuses sound like the guys protecting the sofrim selling possul mezuzas! Imagine the butcher has a counter of “mivtzoim meat” at 25 cents a pound – not 100% kosher but very cheap! Imagine the appliance store selling inexpensive small appliances that 9/10 blow up or burst into flames. Stores selling “mivtzoyim candles” for Neshek and chanukah start fires? Hey, weren’t they selling candles for chanukah that don’t burn 30 minutes? Yep, all those hundreds of thousands of chanukah kits with “possul” candles!!!! Do we tolerate building “mivtzoyim mikvas” that are only b’di’eved but generally possul according to most opinions?